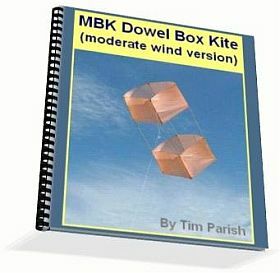 MBK Dowel Box Kite - Moderate Wind Version. Try The Dowel Box Kite Today! will put a smile on your dial! Hi! I'm Tim Parish, a former glider-pilot and now a self-confessed 'kite nut'. I just love getting out to fly something home-made, like this Box kite, any month of the year. Often on my own - can you relate to that? I've been at it for a number of years now, testing and refining many single-line designs. I'm sure you'll enjoy this one! An efficient MBK Dowel design, like this traditional-style Box kite for moderate winds, is so cheap to make. The complete step-by-step instructions ensure success, and a detailed Table of Contents helps you quickly find other information, such as how to do a particular knot. At 1.2 meters (4 feet) long, this kite is a decent size and generates a satisfying pull on a 50 pound flying line in moderate winds. This kite has been proven to have good stability and performance. It's nice to have that peace of mind when gusts or lulls come through! Metric, Imperial, and generic units are used throughout. Hence you don't waste time converting measurements. Quick, Cheap - But GOOD! An MBK Dowel kite is a relatively quick build compared to more conventional fiberglass and cloth kites. Even allowing for gluing time, only a day or 2 need pass before the results can be enjoyed. Not only convenient for you, but it's also good for family harmony! Neatness and space are soon returned. There are plenty of photos illustrating the building steps. Some of these are real close-ups, plus there are 2 in-flight photos. It's hard to go wrong when you can see the original kite taking shape, step by step. Tools and materials are very cheap and simple. Nothing fancy. Most of these should already be sitting around your house somewhere. If not, they are widely available in stores for just a few dollars. Home-Made = Fun To Build, Fun To Fly! Store-bought kites are OK, but there is something extra to enjoy when that thing flying up there was made with your own hands! Even before it flies you'll have fun as the Box takes shape on your shed or living-room floor. When finished, bask in that "I made it myself" feeling. Videos on the My Best Kite website are now being embedded from Facebook. 'About time' say all the visitors using phones and tablets - who couldn't see any video before! Here's the latest: Dowel Box in flight. It's nice knowing you are assured of a high-performance kite, just by following the instructions! Customers sometimes tell me how their kite flew so well, on the first attempt. "Build Your Own" - Get More From Your Hobby! When there is some time to kill, building the Box kite is another option for 'enjoyable things to do'. For example, when you are on a holiday or vacation. This design can be quickly dismantled, rolled up and stored like a Sled kite. This long thin package can be taken just about anywhere, and can be ready to fly in just a few minutes. If you take care of your kite, you will get months or even years of fun out of your small investment of time and money. Making additional kites is even cheaper, since not all your bought materials are used up first time around. That's cheap insurance! That is, a report of an actual outing with the original Box kite. Get inspired to have some good high flights with your new kite too! You might know plenty about handling single-liners, but you can still be entertained by someone else's flying experience with this kite. Print out the e-book as a ready reference while making your Box kite. It's formatted to come out clean and neat, with no awkward split pages or lines. It's not a bad idea to keep each Appendix stapled separately. You can then refer to only those you need at any given time. Nearly all types of computers work with PDF files, so you are unlikely to have trouble using this PDF format e-book. You just need to have Adobe Reader installed on your computer. File size is well under 2Mb. That's a small download, so you can get your hands on it quite quickly. Even over a dial-up connection! So, are you ready to loft a super-cheap kite this week-end? All your Box kite needs is a light or moderate breeze. A bit of gustiness doesn't matter. Follow through the complete step-by-step instructions in your spare time - it's nothing hard. And then look forward to feeling that flying line tension up as your impressive Box kite heads for the clouds! Remember... Every new kite is an adventure! "You did my OLD heart a lot of good today after I had worked very hard on my dowel box kite. It FLEW! I have always wanted to fly a box. It flew like an angel. I'm 62 and that's the first box kite I've ever had."